Tapology.com is a great site for the fans, to pick and predict their winners and see how they rank among all the participants. You can even win $500 cash prize for each event. Select your winners, way of victory (KO/TKO, Decision, Submission) and the rounds. It will also keep track of all your picks and rank you accordingly. I’m throwing down the gauntlet to start a friendly competition amongst my MMAElite peers, and you the readers. 1) I think Mighty Mouse Johnson will be able to utilize his quickness and frustrate Moraga for all five rounds. Moraga will showcase his impressive combinations, but Johnson just won’t be there on the receiving end. 2) I think Ellenberger is hugely underestimating MacDonald, and I believe this will be his downfall. Despite coming back from injury, I expect Rory to take this fight anywhere he wants to, and simply dominate. He’s not ranked #3 as a welterweight for nothing. 3) Ruthless Robbie Lawler is the heavy favorite given the fact that Voelker took this fight on a 2 week notice. They both like to bang, which should make this an exciting fight. I believe the toughness of both fighters make this a 3 rounder. This is actually a fight I’m looking forward to most, behind Ellenbergers vs MacDonald. 4) Andrade has relentless power and she is a BJJ specialist, with all of her submission victories coming by guillotine chokes. But I feel like the UFC jitters will get to her and affect her performance. Carmouche on the other hand has already fought the biggest name in Ronda Rousey, and I expect a seasoned Carmouche to squeeze out this win. 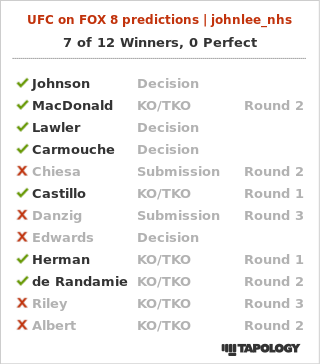 So what are your predictions for UFC on FOX 8? Make your predictions and share!